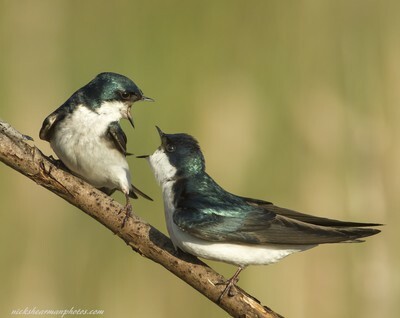 A pair of Tree Swallows having a discussion as to which nesting box would be the best, trust me I watched the whole thing go down ..Keswick ,Ontario. I had decided to go to a small public nature trail which between subdivisions in my home town of Keswick ,Ontario ,with the idea of catching some Redwing blackbirds displaying . I was looking for an early start ,it was a sunny morning and I wanted to catch that low sun light before it got to harsh. At approximately 06.35 I noticed this pair of Tree Swallows checking out two or three nest boxes that had be set up .I was able to approach a little at a time and at 06.50 I was able to get a few shots of them. The early morning light was strong and did cast shadows even at that time of the day so I had to work the sun to get it behind my back as much as possible. I took this shot using my Canon 7D ,500mm canon f4 telephoto lens ,Gitzo carbon fibre tripod ,and a MKII Wimberley panning head . I used my camera backpack as a weight hooked underneath the tripod to add stability to the camera in the spongy dead grass . After watching this pair for some time it became apparent that the decision making as to which nest box to pick was not going well ,they went back and forth looking at nest boxes ,allowing me to work my way closer and closer ,a few feet at time and I finally got into into position for a shot. Now all I needed was for them to come back and look at the nest box again ,and they did ,and at this point it looked like someone had enough and let their thoughts be known, giving me the shot . I always shoot in Raw ,reason being is to have all the information at my disposable during processing . This was a situation that I needed that . Shadow area had to be lightened on one swallows face to bring out the eye . Strong light and white and dark blue subjects can bring the worst out exposure wise, but I was able to correct the tones because I shot in Raw giving me a lot room to work in processing. I tote my camera equipment around in a backpack designed to carry a large telephoto and camera ,Canon 7D ,500mm telephoto ,1.4 converter ,spare batteries , CD player ,stokes bird songs CDs ,speaker wiring ,30 feet plus ,small speaker ,and some camouflage netting for concealment when needed. Bottle of water and bug repellent. Pack some patience (always needed) ,expect the unexpected to happen and try and adjust quickly to it , keep yours open and watch what is going on around you ,anticipate the subjects moves ,and if possible work yourself in the right spot at the right time ,in this case using their distractions to my advantage.